Flocabulary* plays a regular part in my classroom through historical content videos, like their video Gettin’ Byzzy With It about the Byzantine Empire or skill based videos, like Can I Trust It on source evaluation. In this post, however, I am going to focus on Flocabulary’s weekly look at current events in the Week in Rap video series, and how my students used last week’s Week in Rap to learn how to write sketchnotes, a visual note taking strategy. My lessons, and this post, are organized using the GANAG lesson plan schema but can be easily adapted to fit any active learning cycle. For this current events lesson I wanted to introduce to my students how to take notes using sketchnotes, a visual note taking strategy that combines words, drawings, shapes and diagrams to process and record new ideas. The student goal read: I can use sketchnotes to process and record new ideas. After my students wrote down the goal and gave themselves a pre-rating (how well did they already know the goal), I defined for them what sketchnotes are. We then practiced some meta-cognition and I asked them why taking notes using both drawings and written words would be an effective way to learn or process new ideas. This is something I have covered before with them when they add drawings to new vocabulary words we are learning. After giving them a minute of think time the students shared their ideas. We discussed the benefits of creating visual cues, in addition to verbal ones, when learning, and how it helps us to process and recall new information. The students and I then watched the Week in Rap as a whole class. I always show Flocabulary videos two times, which the kids love, because it allows them two viewings to get the details of what’s covered. After the second go around, students broke into partners and read through the interactive lyrics** – I always tell them to start with the ones they are most interested in so that they have some control over what they are learning. After the students read and discussed with partners the questions that go along with each write up***, we then got back together as a whole class. I asked the students which stories from this week stuck out as most important or interesting. 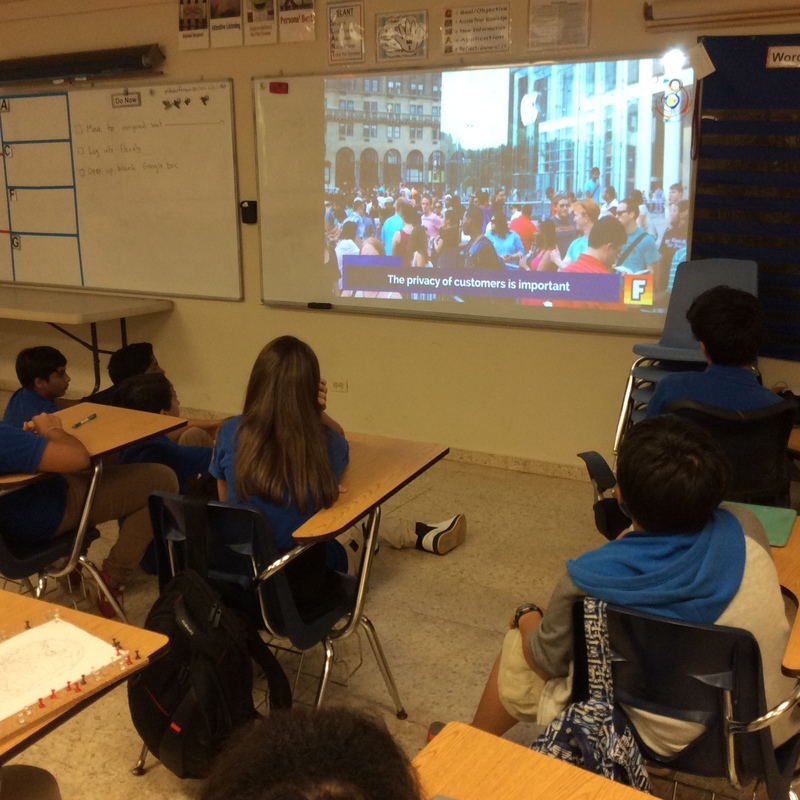 While the students brought up a variety of topics from last week, the story that most caught the attention of my students was the release of the Panama Papers. I then stopped the class and said, “because so many of you are interested in discussing and learning more about the Panama Papers, why don’t we use sketchnotes as we work through the topic.” I explained again to students what sketchnotes were and how to use them. I then said, “as we discuss the Panama Papers we will take some notes, I will model on the board and you all should write in your notebooks.” I told students their notes could look just like mine or could be similar or totally different – depending on how comfortable they felt and what ideas stuck out most to them. 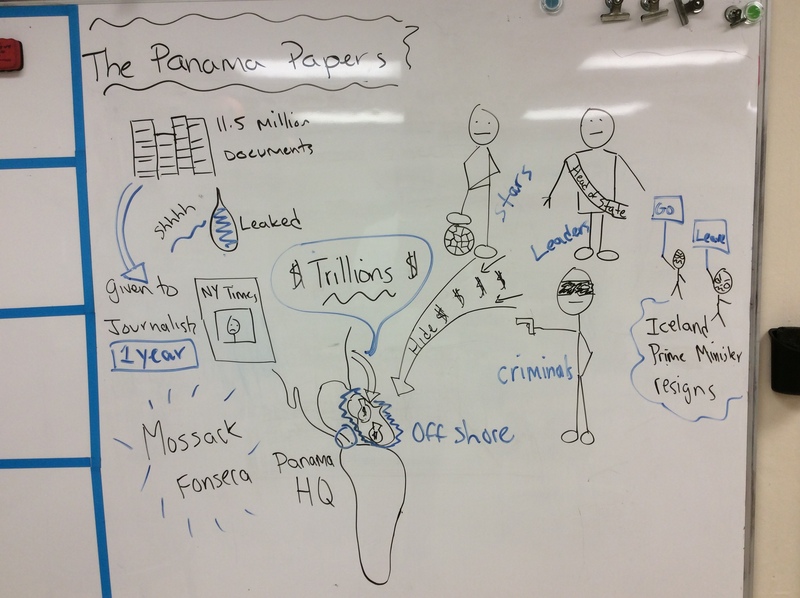 As students discussed what they learned about the Panama Papers, we wrote our sketchnotes. I sometimes told them what drawings and words I was using and why. Other times I asked the students what symbols we could use. A lot of questions came up and we discussed the answers and added more to our notes. The entire class was engaged and excited. Students were calling out and look at each other’s notebooks. It was deep and meaningful learning. With a few minutes to spare in class, I asked the students to go back to their goal. I asked them to define sketchnotes and explain why it is an effective strategy with their partner. I asked a few partners to share out with the class. They then went back and gave themselves an after rating (how well did they understand the goal after the lesson). 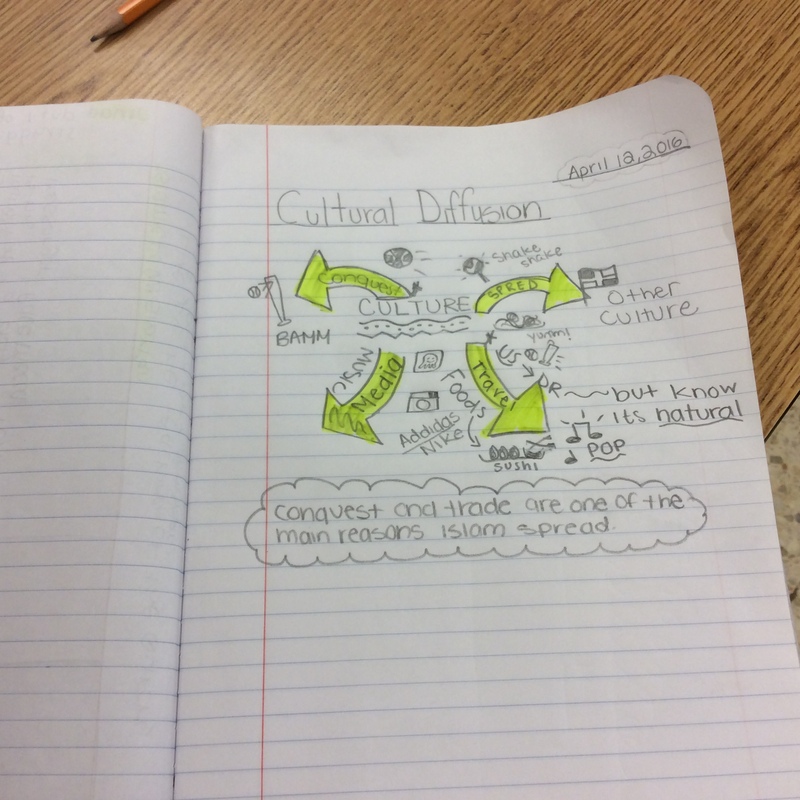 The best part – the next day in class we were covering cultural diffusion and the spread of Islam in the Middle Ages – the students without hesitation used sketchnotes to process and record what we were learning! This lesson can be adapted to fit just about any Flocabulary video. In fact, many of the videos would act as a great introduction to sketchnotes, or visual note taking, due to the excellent animations. The videos would serve as an inspiration and source of ideas for the students. In addition, this activity would work from early elementary all the way up to grade 12. *Flocabulary is an educational hip-hop site dedicated to using rap music to teach school content and skills. A full website review will come another day but when you have some time sign up for a free trial and see what they are all about. I highly recommend it! **All Flocabulary videos are accompanied with interactive lyrics – highlighted lyrics of the song that have a link to additional information. The Week in Rap interactive lyrics also contain a link to a news article or video that takes the topic even farther. ***This year I have asked students to write up what they discuss with their partner. They use an ongoing Google Doc that they add to each current events lesson. This helps to keep them more accountable – and it’s awesome to look back at all of the stories they have learned about this year! Sounds pretty awesome. Maybe I should use sketch notes to understand the Panama Papers. Thanks Drinking the Whole Bottle. Sketchnotes are not just for students and is an excellent strategy for anyone how wants to learn new and complex topics.